Yesterday’s article on Jerry Yang and Yahoo’s renewed intent to be acquired by Microsoft has hit a brick wall. Steve Ballmer speaking at a Committee for Economic Development of Australia lunch in Sydney on Friday said that Microsoft is no longer interested in acquiring them. "Look, we made an offer, we made another offer. 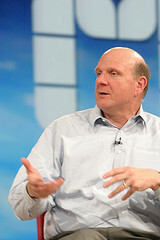 It was clear that Yahoo didn’t want to sell the business to us, and we moved on," Ballmer said. "We are not interested in going back and re-looking at an acquisition. I don’t know why they would be either, frankly," he said. "We tried at one point to do a partnership around search, not advertising. That didn’t work either, so we moved on, and they moved on." Of course these statements follow Yang’s statements at the Web 2.0 conference in San Francisco yesterday, "I believe the best thing for Microsoft to do is to buy Yahoo." However, these statements come too quick in relation to the events happening around. Yahoo’s intention may be a burst of emotion from the failed deal with Google, and Ballmer’s automatic reaction the day after may not yet have gone through the Microsoft board yet. It is possible that an official solicitation could happen. However, with this kind of tension, it’s becoming more unlikely.